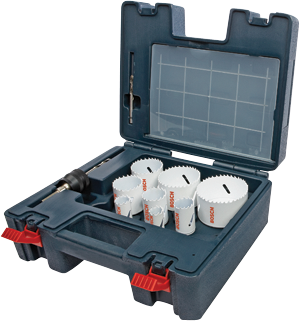 Contains most common hole saw sizes for electrical applications. Quick Changemandrel (PCM38) with two pilot bits (HB85PB). Three small adapters (AN01) and five large adapters (AN02). Hole saws: one 3/4 In. , one 7/8 In. , one 1-1/8 In. , one 1-3/8 In. , one 1-3/4 In. , one 2-1/4 In. and one 2-9/16 In. .